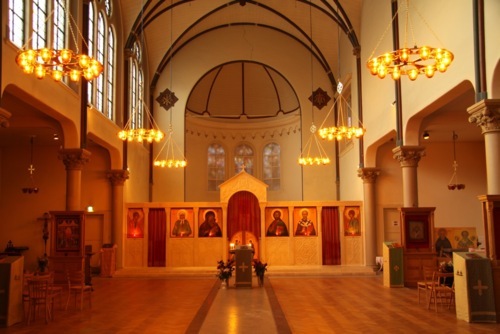 Four recently installed Icon Thrones for the Russian Orthodox Church of St Nicholas, Amsterdam. Dylan Hartley also made the patterns in Finish Birch Ply for the brass chandeliers seen in the picture. The thrones retail at £2700 incl Vat with reductions for multiple orders. The are made with solid European Oak and carved by hand. The thrones were designed by Aidan Hart of Aidan Hart & Co.